I am posting some picture of what we, CC, me, Kid, Disc, Necora have decided for our limit and flags. we of course based our decision on CC which is the mod most used by thousands of people and also the fact that CC is the mod that use the most all flags. we tried to adapt it on what we "non-CC devs" maybe can need for ourselves. Thanks for posting that Red. I see there's still a couple of unused slots. Cool! Trade category is good, should allow us to have "export only" versions of various products, and I like the coins/precious category too. Maybe we'll be getting a bank (for storage)? Sad that there's no homewares category, so we can't have a homewares shop selling "luxury" homewares (candles, pottery, bedding) that provides happiness (basically it would be a different type of tavern). since the banis won't use items like housewares,they may as well all go to trade. be nice if we ever solve how to make the happiness more a factor in the game and use the housewares,silverware,and other products we produce. if work effort could be set to depend on happiness level and we could then affect it negative and posative then these goods become more important. the tags will take time to get used to. it is a weird list. some are so specific and others are way generalized.hopefully it does give us more control and we won't overstock barns with items we aren't using as much. More happiness isn't really needed, is it. It's so easy to generate. Give them a graveyard and a tavern and that's about all they need. But it would be nice to actually do something with candles and all those other items, other than just ship them out to someplace else. @RedKetchup Is it possible to make a mod that reduces the amount of happiness you get from taverns/graveyards/etc? My guess is that it's not possible because no one has done it. But happiness is really quite easy to provide in the game, it would be interesting if it could be made harder. 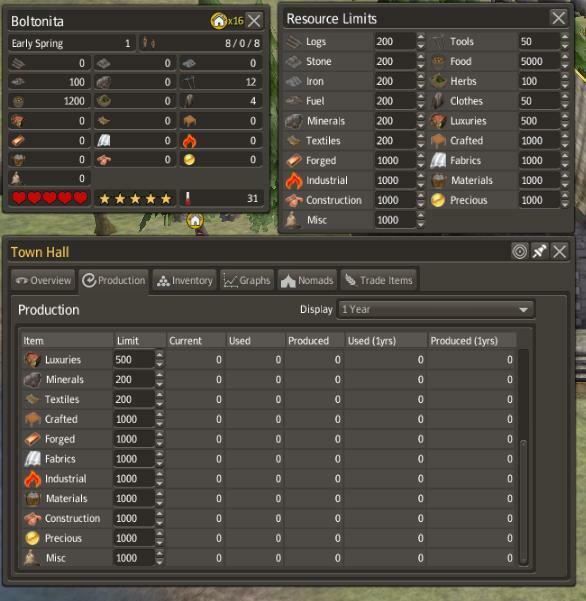 @RedKetchup I know we can have 'inedible' options for some food (Kral has his mods), can something similar be done for "Crafted", so that we can have a storage barn for "Crafted" items, but the vendors from the markets can't pillage them? Or would that also mean that the Traders staff can't use them either to fill the trading posts? In any event, we could in theory have a storage barn for "Crafted", and have set up in the manufacturing districts? I would set one up next to my trading post, or use the 'warehouse' and control the flow of goods. all storage need to have flags , and this is with flags you can control what goes there. market too use flags. if they dont have that certain flag , they wont try to steal it. so if you have a market that has "crafted" of course they will fill up from barns that had "crafted" set. you cant control what is getting out of barns storage and who are picking up from barns. it is free open and welcome to anyone. there was a discussion a while ago dealing with happiness. i don't think we ever reached a conclusion on a better way to control or use it. that's the only way i see that we could get the banis to use those extra items and have an affect on the game. banis eat food and use tools,eat medicine,and wear clothes. household goods don't fit any of those. houses use firewood. can we add something to that part of the code? split the firewood into 2 parts and set the house to use x amount of firewood+ x amount of something else per year?? how much control over the education code do we have??? i take it after a child becomes school age and they don't go to school we can not add to the banis eduaction level at all? say a bani didn't go to school and 3 yrs goes by is there a way then to add to his education level which would increase his productivity? the only other way i come up with is the houses themself can be upgraded by using those housewares,blanklets,furniture,etc. then the upgraded house uses less firewood. i think this way causes more problems than it solves. poor banis slave away making items they never get to use. they send it on a boat to the rich people somewhere living in the kingdom. kinda like paying taxes aint it? is there a way then to add to his education level which would increase his productivity? poor banis slave away making items they never get to use. let's keep the forests alive.